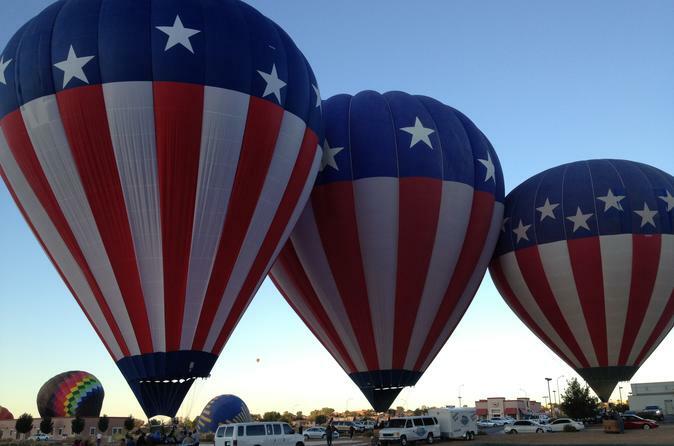 Get ready for an early morning hot air balloon flight along the Rio Grande in Albuquerque! Watch as the balloon inflates and then board the basket for an experience of a lifetime. Gently float over Albuquerque and see the beautiful scenery surrounding you. After your approximate hour-long flight, you'll land and enjoy a glass of champagne and light refreshments and receive a flight certificate commemorating your adventure. Your hot-air balloon adventure begins as you meet your crew at the launch site, conveniently located on the west side of the Rio Grande River. After check in the pilot will perform safety and weather checks, then the crew will begin preparing the balloon for inflation. Once inflated, you will launch and fly for approximately an hour alongside the river valley. During the flight, depending upon the direction of the winds on flight day, you will have great views of the Sandia Mountains to the east, Petroglyph National Monument to the west, the volcano’s that surround Albuquerque and Mount Taylor in the distance. There will be a "chase crew" that follows during the flight who will meet you shortly after landing to pack up the equipment. From here, you will return to the launch site for a champagne ceremony and a light snack. There are non-alcoholic alternatives available. Each person that flew will receive a commemorative flight certificate to celebrate their adventure. The total time your tour will take is approximately 3.5-hours and you will be in the air for approximately 1-hour.